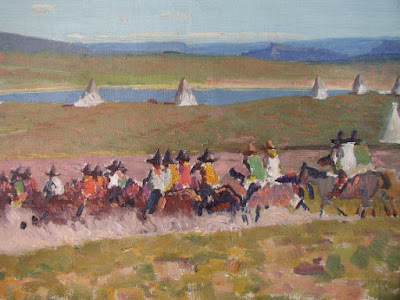 "Road to the Pueblo" "Organ Mountains"
Oil on canvas, 8" x 19.5"
"Indian Camp" (1902) "Velarde Adobes"
"LaLoma Chapel" "Portrait of Indian Boy"
"Song of the Road" "Jeantete's Rd, Taos"
Blumenschein said his arrival in Taos forever changed his life. the superb beauty and severity of the hills, stirred me deeply." "I rode over foothills, thru gorges, out upon the great desert plateau. Slowly I moved across a vast sage brush plain under vast and beautiful skies. The morning was sparkling and stimulating. The beautiful Sangre de Cristo range to my left was quite different in character from the Colorado mountains. The sky was a clear, clean blue with sharp moving clouds. In the distance: snow capped mountains, romantic mountains, green everlasting mountains. I saw a few wild animals, a few strange dark people but they were quite insignificant in this superb landscape. My eye was enraptured by a glorious impressionist. Never shall I forget these first powerful impressions. My own impressions, direct from the new land, thru my own eyes, not another man's. Not another's adventure. I was receiving ... The first great unforgettable inspiration of my life. The Taos Valley and its surrounding magnificent country would be the end of our wagon trip." 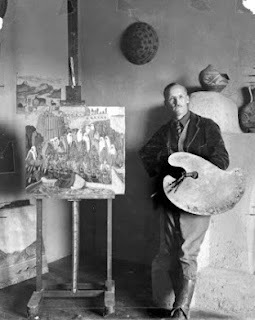 When Blumenschein first saw Taos he said: "I was receiving...the first great unforgettable inspiration of my life." 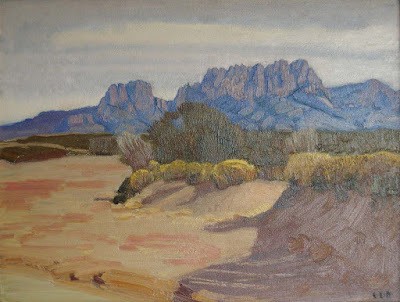 "No artist had ever recorded the New Mexico I was now seeing. No writer had ever written down the smell of this air or the feel of that morning's sky." Blumenschein summed up Taos: "We all drifted into Taos like skilled hands looking for a good steady job." and to give to the deepest extent of each man's caliber. We lived only to paint." “I can’t explain why I paint and draw. It is as necessary for me to do as for an apple tree to produce fruit. Just a job I love." 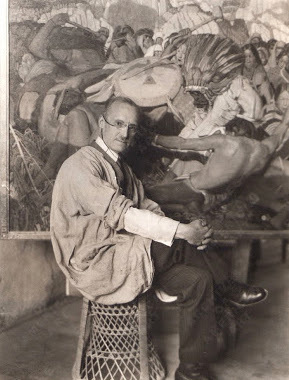 Ernest Blumenschein was an illustrator, mixed media and mosaic and fresco and paint muralist, Plein Air and easel painter. 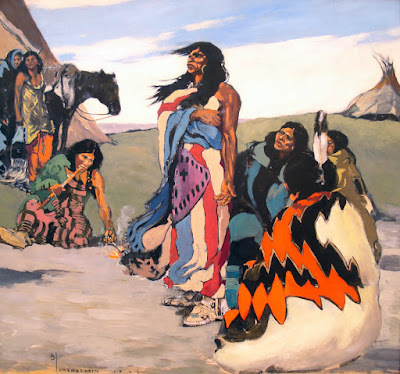 His media included oil paints, pen and inks, watercolors, Mixed-Media and Multi-Media, gouache and colored pencils. 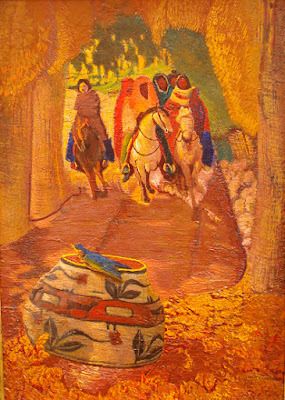 Horses, landscapes, Native American Indians, National Parks and State Parks. 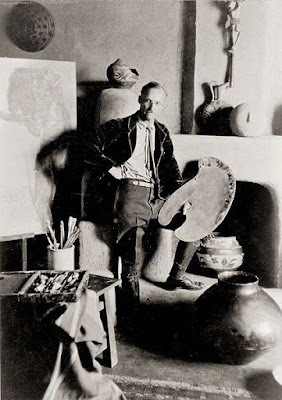 He was a Taos modernist. Blumenschein was born in Pittsburgh, Pennsylvania. His important teachers include Benjamin Jean-Joseph Constant, Jean Paul Laurens and Fernand Lungren. As the son of a musician, he received early exposure to the Arts. In 1891, at 17 he won a scholarship to the Cincinnati College of Music and The Art Academy. In 1892 he attended the Arts Students League in New York City. He supported himself by his musical talents, performing as first violinist for the conductor of the New York Symphony, Antonin Dvorak. 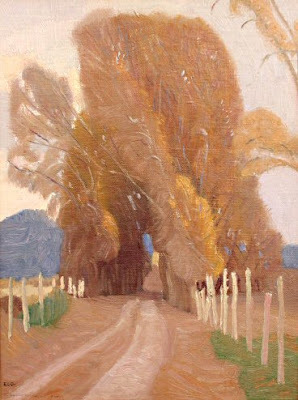 In 1894 he studied at the Académie Julian in Paris. 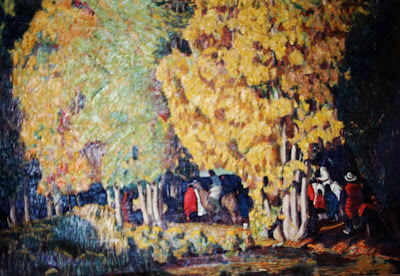 He continued studying at Académie Julian in 1899 and from 1902 to 1909. 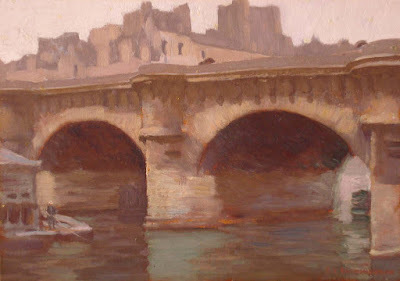 He studied at the Ecole des Beaux Arts, Paris. In Paris he met Bert Phillips, E.I. Couse, and Joseph Henry Sharp. 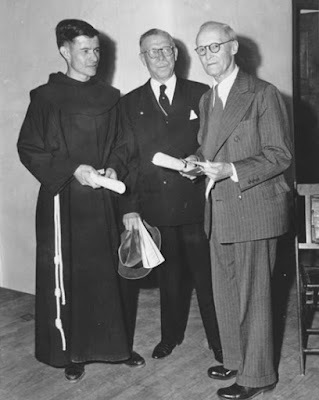 He became close friends with Sharp and Phillips. Sharp told him about New Mexico and invited him to visit. In 1896 he returned to New York. 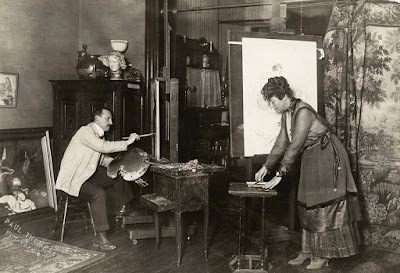 Phillips and Blumenschein shared a New York Studio. 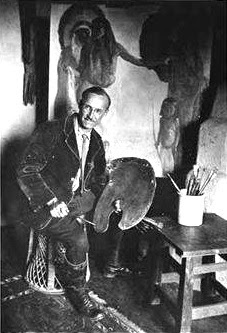 In 1898 the "fortunate accident" of a broken wheel led Blumenschein and Phillips to begin the Taos Art Colony. In 1902 Blumenschein returned to Paris to continue his studies while still supporting himself as an illustrator. In 1904 he created illustrations for the first book by Jack London, Love of Life. He also worked with Stephen Crane, Willa Cather, and Joseph Conrad. In 1905 he married Mary Shepard Greene. In 1909, they moved to New York and taught at the Pratt Institute. 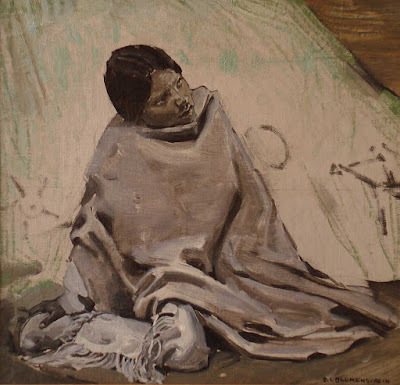 From 1910 on, Blumenschein worked in Taos in the summers and in New York in the winters. 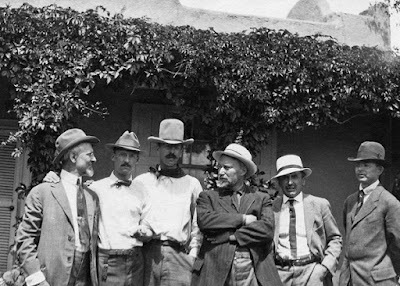 together with Joseph Henry Sharp, E. Irving Couse, Oscar E. Berninghaus, W. Herbert Dunton and Bert Geer Phillips. while he and his wife worked on illustrations. She was a jewelry designer as well. 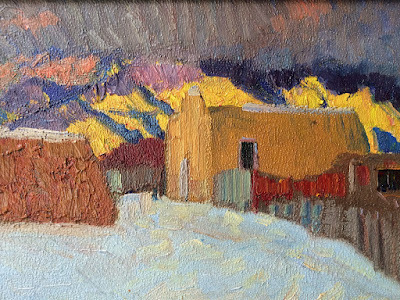 In 1919 the couple moved to Taos permanently, acquiring an 11 room house on LeDoux street. 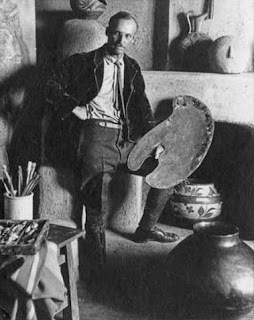 From 1920 to 1921 he was president of the Taos Society of Artists. 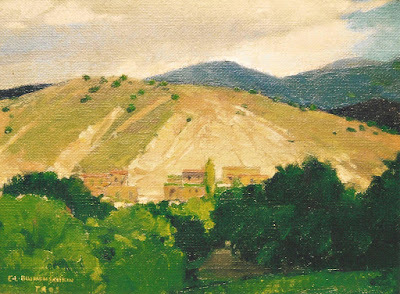 In 1927, he won full membership to the National Academy of Design. Blumenschein painted vigorously throughout his older years. He died in 1960 in Taos, New Mexico. In 1966 the Blumenschein home was designated a National Historic Landmark. Parsons does not offer Ernest L Blumenschein prints, because no print can compare to the real paintings. 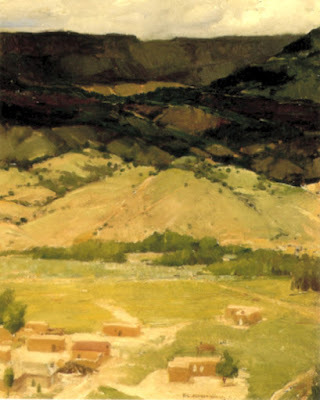 "Something else by J. Breckenridge Ellis"
"Wards of the nation--their first vacation from school"
Blumenschein and Phillips started the Taos Art Colony because of the "fortunate accident" of a broken wheel in 1898.